It’s easy to mock Silicon Valley, where too often companies repackage familiar ideas and sell them back to us as exemplars of Groundbreaking Disruptive Innovation™. But, if you’ll pardon a pun that will explain itself in just a moment, you’d be hard-pressed to find a sillier example of that tendency than Juicero. 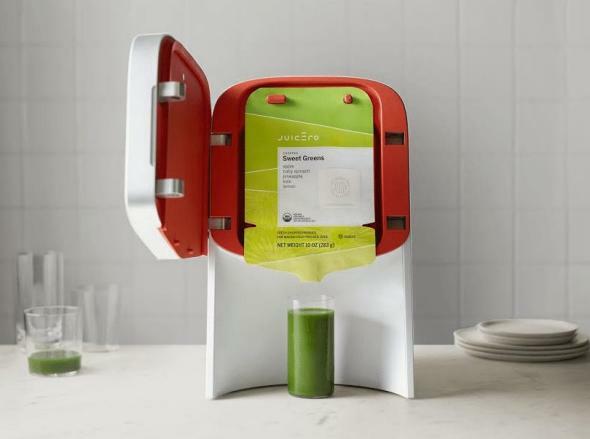 As startups go, Juicero’s premise is simple enough: You buy a bulky $400 countertop device along with packets stuffed with raw fruits and vegetables. The machine subjects these packets, which cost between $5 and $8, to pressure, excreting out supposedly wholesome beverages with names like Glojito (“single digit sugar content, with a hint of mint”), Green Zing (“Leading with pineapple and finishing with basil and ginger”), and Root Renewal+ (“Featuring … two rhizomes which may help keep inflammation at bay”). If you’ve ever wrangled a home juicer setup, you’ll probably understand why this may have seemed like a reasonable proposition to some of the investors who’ve pumped tens of millions of dollars into the company. Juicing is a messy, expensive business, typically leaving more gross pulp than drinkable extract, and it can be hard to find the right ratios in a home setup if you want to make something that goes down smoothly. As with the proverbial better mousetrap, there probably is a market for an easier juicer. Bloomberg performed its own press test, pitting a Juicero machine against a reporter’s grip. The experiment found that squeezing the bag yields nearly the same amount of juice just as quickly—and in some cases, faster—than using the device. … Reporters were able to wring 7.5 ounces of juice in a minute and a half. The machine yielded 8 ounces in about two minutes. Other Silicon Valley innovations to the juicing process proved similarly extraneous. As Bloomberg notes, “The device also reads a QR code printed on the back of each produce pack and checks the source against an online database to ensure the contents haven’t expired or been recalled.” Significantly, this means that your juicer requires an internet connection to do its job, which feels like a pretty silly complication for a device designed to make your life simpler. In any case, as it turns out, “[t]he expiration date is also printed on the pack,” rendering this “feature” still more unnecessary. Bloomberg’s terrific story is worth reading in full (make sure to watch the accompanying video), but here at Slate, we’re still left with a few other questions. Perhaps most notably, What is the Juicero even doing? If you can squeeze juice out of the bag by hand its contents have, presumably, effectively already been juiced. On its website, Juicero claims that it doesn’t do anything other than wash, chop, and pack its fruits and vegetables. But as the accompanying pictures suggest, the verb “chop” is doing a lot of work here: The ginger looks like it’s been aggressively minced while the carrots appear to have been passed through an uncommonly fine grater. Then again, maybe that’s not the point. As Katy Waldman has suggested, juice itself has become a status symbol of sorts. In that sense, maybe those all-but-useless Juicero machines sitting on counters are doing exactly what they’re supposed to do: telling visitors that you drink juice.